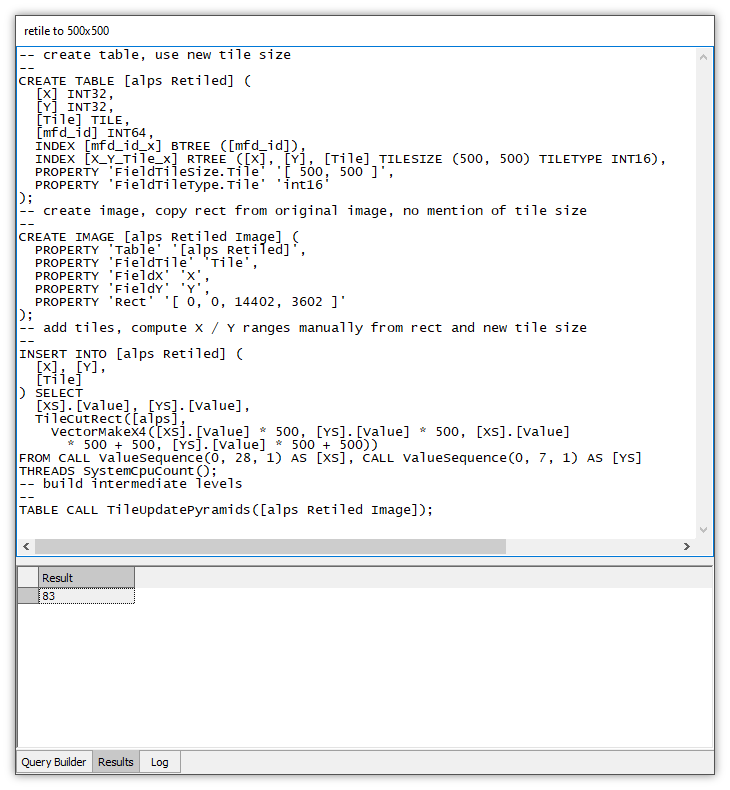 Starting with an image that uses a tile size of 128 x 128 pixels this SQL example creates a copy of the image using 500 x 500 pixel tiles. Our example project contains a table with tiles and an image that shows those tiles. 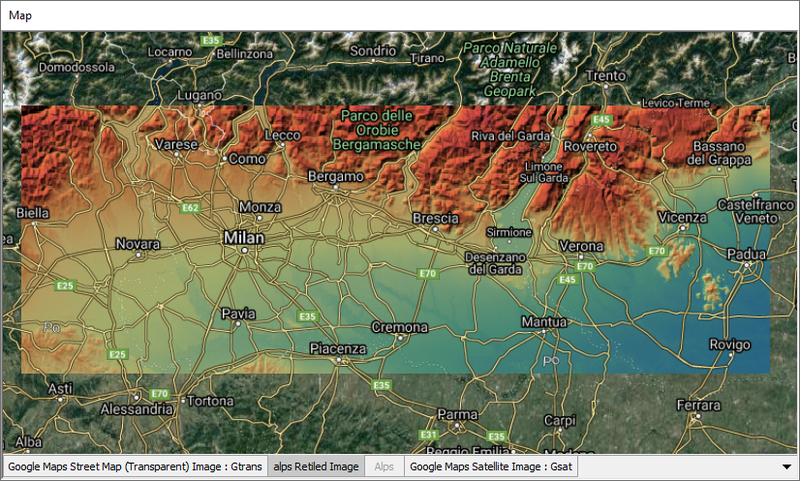 The image shows terrain elevation in the Alps in the Northern part of Italy. 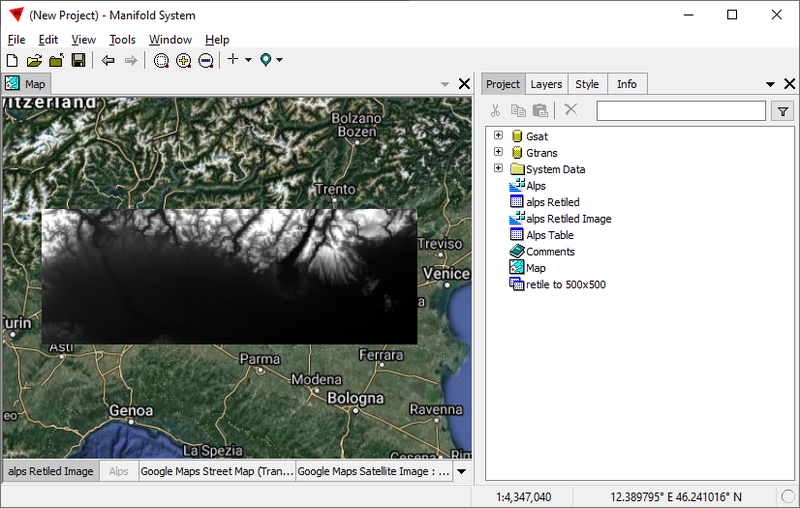 A map displays the Alps image along with two web server layers from Google which provide context: a satellite image layer as the background and a transparent labels and streets layer to mark cities and roads, which can be dragged above the terrain elevation layer. Opening Alps Table we see the tiles which make up the raster data set are 128 pixels by 128 pixels in size, with each pixel containing containing a single channel of data type int16 data. 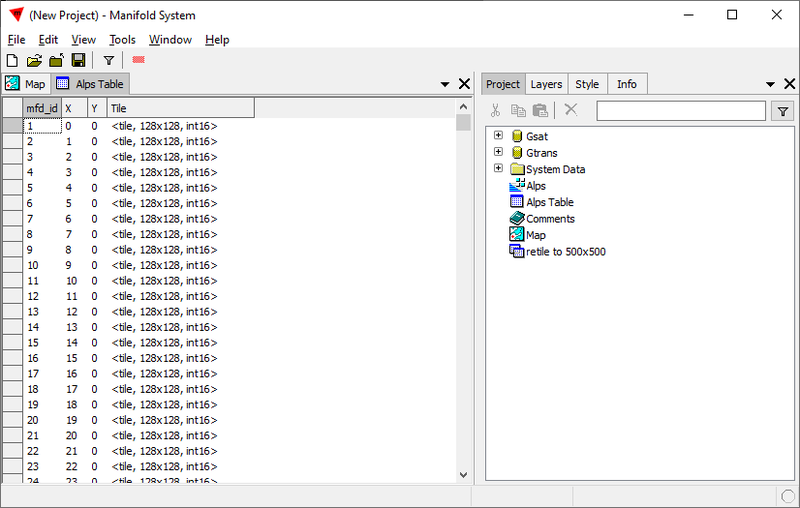 The data shows terrain elevations taken from Space Shuttle SRTM data, merged together from several SRTM tiles using the procedure shown in the Example: Merge Images topic. Right-clicking on the Alps image in the Project pane we can choose Properties to see the properties of the image. Important information for the SQL we will write is the Rect values, in particular that the image is 14402 x 3602 pixels in size. 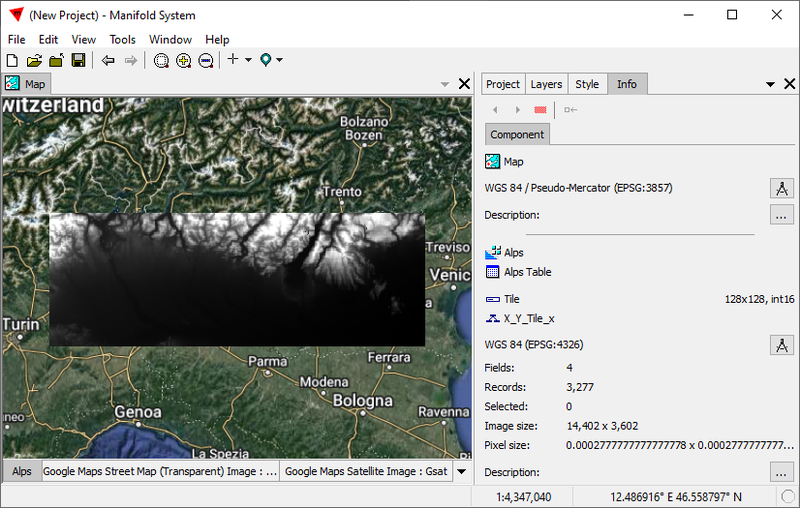 With the focus on the Alps image layer of the map, the Component panel of the Contents pane shows the Alps image uses a coordinate system of WGS 84 (EPSG:4326). We will need to assign this coordinate system to a component our query will create, so using the procedure given in the Favorite Coordinate Systems topic we have saved it as a favorite. That will allow us to assign it with a single click. We double-click the query to open it in a Command window. We Alt-click the title tab of the Command Window to undock it, as seen below. The numbers for PROPERTY 'Rect' '[ 0, 0, 14402, 3602 ]' come from the Properties dialog for the image which shows the rectangular dimensions in pixels of the image in the Rect property. No other parts of the query depend upon specific numbers, other than, of course, our specification of a desired tile size for the new image of 500 x 500. To run the query we press the ! button in the main toolbar. We could also run the query from the Project pane by Right-clicking on the query and choosing ! Run. To run the query we press the ! button. 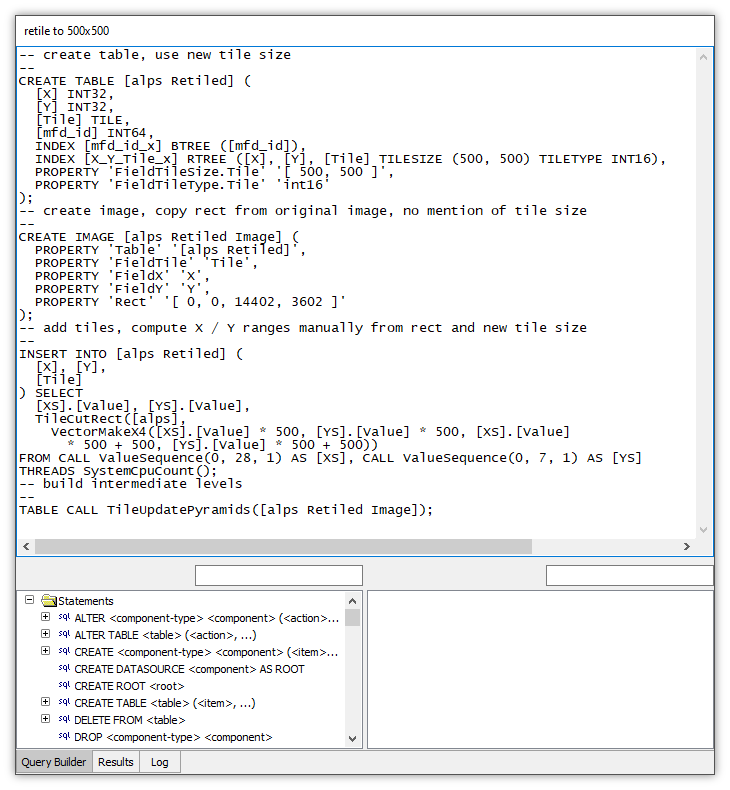 The Result of 83 is the number of records in the last operation in the query, when intermediate levels are built using the TileUpdatePyramids function. 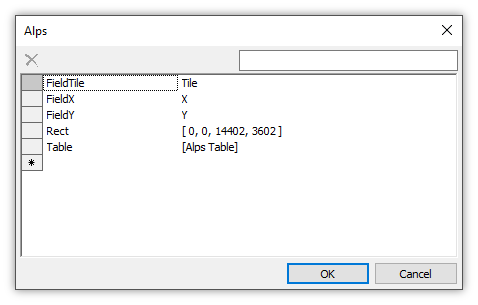 In the Project pane we see that a new table and image have been created by the query, the alps Retiled table and the new alps Retiled Image that uses tiles from the table. In the illustration above, we have turned off the Alps image layer in the map and have dragged and dropped the new alps Retiled Image into the map. However, the alps Retiled Image does not appear. 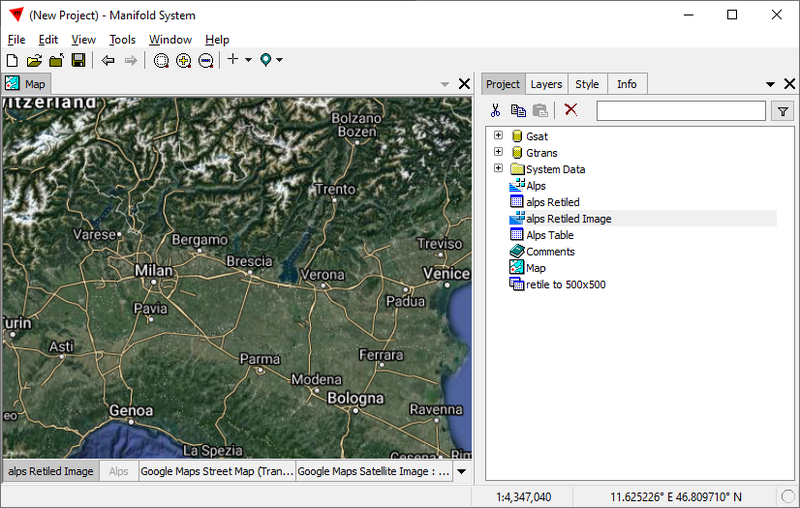 With the focus on the alps Retiled Image layer of the map, the Component panel of the Contents pane shows, by showing the coordinate system in red text, the new image requires us to assign an initial coordinate system. We press the coordinate picker button to do so. With a single click we can choose the coordinate system of WGS 84 (EPSG:4326) that we previously saved as a Favorite. The alps Retiled Image immediately appears in the correct location. The Component panel also reports that the image is made up of tiles that are 500 x 500 pixels in size, of data type int16. We can undock the map window to make it larger. Using the techniques shown in the Example: Merge Images topic we can style the image to show terrain elevations and hill shading. In the illustration above, we have moved the Google transparent streets layer above the alps Retiled Image layer to provide streets in context above the terrain elevation image.